Sorry about the late post! I had orientation for my new job this morning and have been trying to sleep the rest of the day because it’s a night shift and they want me to start tomorrow night. I need to stay up tonight and sleep tomorrow. I still haven’t decided whether I’ll try to post in the evening or in the morning but I’ll have to pick one of the two or just delay the publishing. Anyways, on to the post. If I was to ask most people, who knew what StarCraft is and knows a little of the story, who the main character was I would probably get a lot of the same response. Jim Raynor. However, I would argue that the protagonist of the StarCraft games is in fact Sarah Kerrigan. Sarah Kerrigan had a rough start. She didn’t choose to be born with the gifts that she was and she most definitely didn’t choose any of the big decisions that really has shaped her life. Now, I want to point out that I’m not going to be going too in-depth with this character. To do that would take way too long so I’m going to stick to the basics. If you’ve played the StarCraft games then you probably won’t learn anything. Besides, to me this series is too awesome to spoil too much of. So if you haven’t played the StarCraft games… stop reading this and go get ’em. Anyways, back to the story. Sarah Kerrigan is a victim to the fate that has been set upon her. At an early age her psionic potential became apparent; through a freak accident she killed her mother and wrecked her father’s brain. She would be haunted for a majority of her life by this and would feel at fault. The Terran Confederacy, upon hearing of the accident, realized Kerrigan’s true potential and for all intents and purposes kidnapped her to be a part of their Ghost program. They would try their hardest to instill into her a zeal and loyalty for the Confederacy but it would never happen naturally. Kerrigan was strongly against the Confederacy from day one for the way that they would torture their Ghost candidates and subject them to some of the most inhumane practices. Eventually, by the means of a neural implant, Kerrigan finally came under control. Possessing a power so remarkable that the measurement scale had to be changed, Kerrigan would work for the Confederacy committing assassinations and political murders. She didn’t like some of the things she did but it was her job and she did what she was ordered. During the Korhal uprising, Kerrigan would make the assassination which would start putting her life in a totally different direction. She was sent to kill the senator, Angus Mengsk. Her team killed his wife, his daughter, and actually beheaded him. It was this sort of excessive violence which was going to be the Confederacy’s downfall. Angus Mengsk’s son Arcturus would lead a new rebellion, the Sons of Korhal, who would bring the Confederacy to its knees. They would do this, however, with the help of Kerrigan. 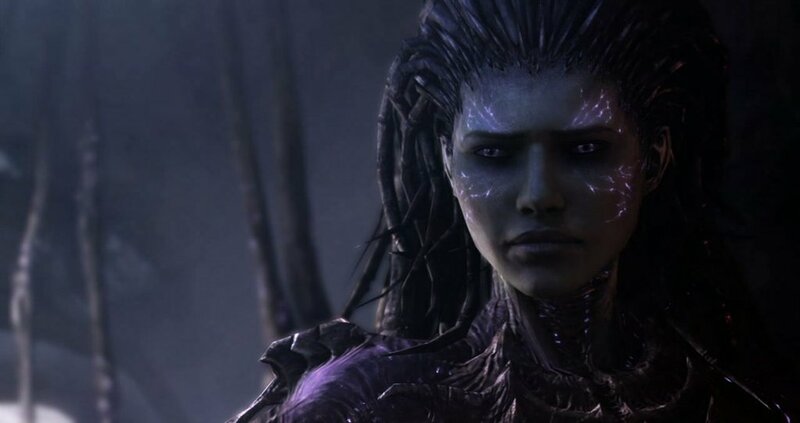 After kidnapping her from a science facility the Sons of Korhal would use Kerrigan on many missions. This where her and Raynor first meet and begin developing a relationship. Eventually the war reached Tarsonis, the capital of the Confederacy. Mengsk wanted to level the planet in revenge for the death of his family, and he sent Kerrigan to enact his plan. Mengsk had taken control of psi emitter devices which would lure the Zerg swarm to the world and do the work of purging it. After a lengthy battle at New Gettysburg, where Kerrigan held of the Protoss armies who had come to fight the Zerg, the dead was done. Mengsk had his revenge… almost. Mengsk had always known that Kerrigan was one of the Ghosts who had killed his family but he hadn’t killed her because she was too useful. He had always told her that he had forgiven her because of the good she was doing but that was just him lying to get her to do what he wanted. When the psi emitters where activated and there was no hope for Tarsonis, Mengsk left. He left Kerrigan there to die. That would be his biggest mistake. The Overmind of the Zerg saw Kerrigan’s raw psionic power and the potential that she held for the Zerg. The Overmind had been made by an ancient alien being known as the Dark Voice. The Dark Voice created the Overmind with the intent to set up an apocalyptic prophecy that would result in the universe being remade in his image. The Zerg were supposed to play a major part in this plan. The Overmind whole purpose in existence was the perseverance and propagation of the Zerg and was thus not too keen on assisting the Dark Voice’s return. To this end, Kerrigan was captured and forced to undergo a mutation that would change her into the Queen of Blades. As the Queen of Blades, Kerrigan’s powers increased exponentially yet was not under the control of the Dark Voice. Her personality drastically changed, Kerrigan led the Zerg on many campaigns and conquered many worlds. Kerrigan would eventually rise to become the true ruler of the Zerg after the Overmind was killed by the Protoss. Eventually Kerrigan would come into knowledge of an ancient alien device which was supposed to have great power. The problem was that it was broken into pieces that where spread all over the sector. She began to search for them, but she was not alone in doing so. Jim Raynor and his men had been commissioned by a corporation to find these artifacts. Raynor would complete this task, and in doing so learned that this artifact might have the potential to reverse Kerrigan’s mutation. After a heated battle, Raynor was able to activate the device outside of Kerrigan’s stronghold. Her mutation seemed to be mostly reversed and she was brought in to be studied, looked after, and to make sure that there were no residual tendencies to murder. Before she could be completely cleared, however, Mengsk arrived. He had heard about her new condition and sought to eradicate her for good. During the escape and battle between Mengsk and the rebel forces, Raynor seemed to be lost. His condition unknown, Kerrigan and the rest of the rebels had to escape. Mengsk broadcasted a message heralding Raynor’s capture and execution. This put Kerrigan into a deep sadness and, ultimately, a deep need for revenge. She had finally had what seemed like her old life back only to have it ripped away from her. She dedicated everything she had from here on out to revenge. Kerrigan went back to the Zerg and offered herself back to them. After taking a new Zerg form, and having even more power, she began a crusade to bring down Mengsk. Eventually she would learn that Raynor was not truly dead, but this couldn’t stop her. Over her whole life with the Zerg she had come to understand her true role in the universe. She was the one who would have to stand up to the Dark Voice’s return. Mengsk’s political scheming would only get in the way of the human forces being able to help so therefore he had to die. After a long and grueling campaign to bring the Zerg back to their full power, and with the help of Raynor, Kerrigan was able to take Mengsk down. Raynor had been reluctant to assist Kerrigan in her new form with the Zerg but he could tell that she had changed. No longer was she the terrifying force that would cleanse worlds of humanity, but now she would use the Zerg in the best way she could to combat the Dark Voice. This is where we stand now before Blizzard releases the next StarCraft game, Legacy of the Void. Kerrigan is taking the Zerg swarm into space to prepare them for their greatest threat. Raynor and his forces are behind her and support her and I can only assume that in the Legacy of the Void expansion that Zeratul will come around as well. The three races have to stand together to fight an ancient evil. Goodness, even with trying to be skimpy on the details that turned out to be a long one.